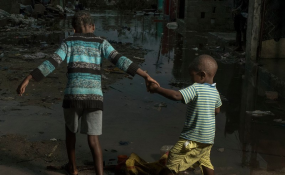 Maputo — MOZAMBICAN children are showing signs of severe psychological stress, including bedwetting, nightmares and anxiety a month after Cyclone Idai hit the country. Children's rights groups said the minors were also becoming clingy or more aggressive following their ordeal. The children witnessed the deaths of hundreds of people and massive destruction of homes during the worst weather crisis to devastate the Southern African country. "We are extremely concerned about the long-term wellbeing for the children in the aftermath of this devastating cyclone," said Maria Waade, Save the Children's Mental Health and Psychosocial Support Specialist in Mozambique. Waade said many children saw their parents or siblings swept away by the floods or have witnessed their homes crumble around them. Save the Children is appealing for long term commitment by the international community to help victims, including children, to recover from their experiences. "After a disaster of this scale, the world must not look away," Save the Children's Response Team leader, Machiel Pouw, said. Cyclone Idai made landfall in Beira city on March 14. It destroyed houses, schools, warehouses and crops in its path, ripping through the daily lives of children. Close to 1 million children were affected. Many are now living in tents, schools or in temporary settlements, with limited access to clean water or sanitation. Save the Children has been on the ground in Mozambique since the cyclone struck. It is rolling out a child protection and psychosocial support programme, in addition to providing emergency shelter, food and healthcare.